Note: for a vegetarian dish omit the shrimp and substitute tofu. As far as the fish sauce is concerned, I think some combination of vegetarian soy sauce and lime juice might achieve a similar taste. Fast, well maybe fast if you have someone cooking and another chopping. The perfect dish for us! So chop, chop, chop and stir fry. In about half an hour we have it all assembled and cooked. I chopped up some cilantro, peanuts, and green onions for garnish. Also I put some bean sprouts on top. 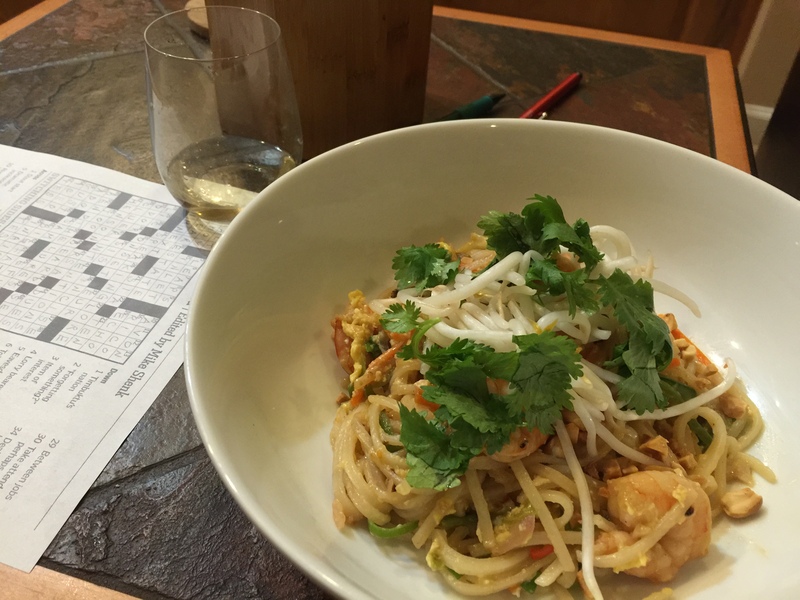 For a pad Thai without the onus of preparing tamarind, this was really tasty. This entry was posted in Eggs, Shellfish, Vegetables, Vegetarian and tagged carrots, Eggs, fish sauce, garlic, limes, noodles, Onions, pea pods, shrimp, Vegetables, vegetarian. Bookmark the permalink.